The world loves Gummy Chews. They come in all shapes and sizes and are a top treat. Superberries has our own Gummy Chews. It is shaped like a berry and made from organic Aroniaberries, sweeteners and natural colors. Here’s a few fun facts about gummy chews and how they came to be one of our favorite treats. Haribo, the leading manufacturer of Gummy Bears, first gummy bear, was made out of licorice and called “dancing bears.” It wasn’t until after World War II that the popular bear-shaped, gelatin-based colorful gummy treats were invented. Haribo, the Gummy Bear Company says that if all the gummy bears they produce in one year were lined up head to toe, it would create a chain that would circle the planet four times. Add in all the other brands and varieties of gummy chews and the chain would probably go around 5 times. Haribo, the maker of Gummy Bears opened its first American factory in Baltimore. But another German gummy chew manufacturer Trolli introduced the gummy worms a year earlier. Gummy vitamins now account for 7.5 percent of the $6 billion multivitamin market in the United States, according to estimates from the Nutrition Business Journal. Gummy vitamin products have seen a 25% increase in sales and now account for $1 billion of the $41 billion supplement market in the U.S. Further proof, we love our gummies! 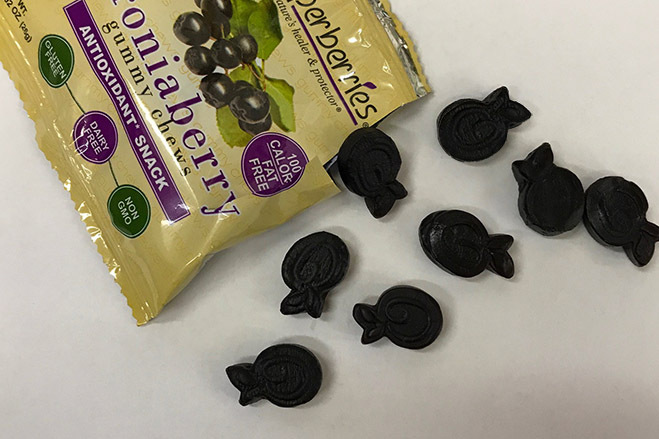 Superberries began offering our Aroniaberry Gummy Chews over 7 years ago as another great way to add the mega antioxidant, the Aronia berries to your diet. The gummies deliver antioxidants in every bite. The gummies are shaped like berries and have delicious berry flavor that makes them a favorite for kids and adults. Our gummy chews are made from organic aroniaberries, sweeteners and made with natural colors. They are NonGMO, Dairy and Gluten Free. Ten to 11 gummies are only 100 Calories and there are two package options, 16 oz. bag of Aroniaberry and the 100 calorie packs which come 10 per bag. The largest gummy bear in recorded history according to the Guinness Book of World Records is an 81-pound, 3-ounce gummy bear that stood two feet tall and two feet wide. A Sunday school class teamed up with a restaurant in San Antonio, Texas to create the giant gummy bear. There is also 3 lb. gummy worms and gummy bears that are for sale online. There is a shop on Etsy that is totally devoted to creating jewelry out of gummy chews. If you get hungry, you can always eat your jewelry. Another use that is becoming popular is mixing gummies in your favorite drink to add more flavor and a gelatin texture. For more amazing facts about Gummy Chews and Bears, check out these articles.